Create custom labels for your next big company event. Give away thirst quenching water bottles branded with your logo at a company event. Print water bottle labels with a permanent, all-purpose adhesive that instantly sticks and shows off your brand long after the major event. We print your custom water bottle labels in two forms normally used at events and as promotional materials. The durable, waterproof nature of white vinyl makes it the most advisable material among the options available. The label will stick long after the event or distribution, reminding customers of your company after keeping the water bottle. Good to Know: These personalized water bottle labels are different from the wraps used by major water companies. The cut-to-size and roll labels have a permanent adhesive, while the commercial water bottle wraps are heat-sealed but have no adhesive. Print your water bottle labels as rectangle, square, circle, or oval shapes. Each shape comes with their respective size options. Select sizes above 2”x 2” for the square, circle, or oval shapes. Order the 2” x 8.5” for rectangle labels meant to wrap around the bottle. Note: All shapes and sizes are best applied on water bottles with a flat or straight surface. Upload your artwork file today or start creating a design using our water bottle label templates. Cut-to-size water bottle printing for labels are done the same day they’re ordered. 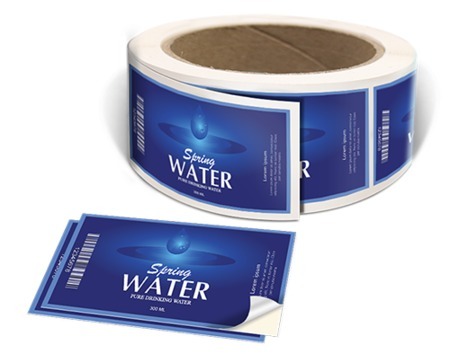 Roll water bottle labels can be ready to ship in just two business days. Which is the best label type to order if I require a large quantity of custom water bottles? Order a set of roll labels for a minimum of 250+ pieces. All labels come on a roll with a 3” diameter core that fits most label dispensers. The continuous roll format allows for quick and easy machine labelling application. What are the popular water bottle label sizes? If you need a label that wraps around the entire bottle, choose the 2” x 8.5” from the rectangle options. The rectangle 2” x 4” for the roll or the 2.5” x 4” for the cut-to-size is usually chosen for half-wrap or front only label designs. How do I measure the exact size for my water bottle label? 1. Use a flat ruler to measure the width of the bottle's bottom face. The resulting measurement is the diameter. 2. To get the width, multiply the diameter by 1.34 (pi). 3. To get the label height, measure the flat surface's height from one curve to another. 4. It's best to remove 1/8 to 1/4 inch from the width and 1/8 from the height if you plan on applying the label by hand. 5. Add 1/4" to the width if the label ends should overlap. 1. Measure the side on which the label will be applied. 2. Use the rule to measure the surface area's height and width. 3. The height and width indicate the label dimensions listed in our available sizes. For example, a label that is 2 inches tall and measures 8.5 inches when wrapped around the bottle is at 2" x 8.5". How do I make my own water bottle labels? 1. Choose the appropriate size and shape for your water bottle. A 2” x 7.5” or 2.125” x 8.125” rectangle roll label wraps around a 16.9 oz bottle. The 2.25” x 7.25” rectangle roll label fits a 12 oz. bottle. 2. Select your preferred material for the label. 3. Download one of our water bottle label layout templates. Use it as a guide for placing your logo, company details, and other important design elements. The turnaround time refers to how long it takes to produce your order. Cut-to-size water bottle labels can be made the same day they’re ordered. Roll water bottle labels can be ready to ship in just two business days. Our water bottle label templates ensure that your artwork meets our printing guidelines. You can download the free printable water bottle label template in an EPS, PDF, or JPG format. Give away custom water bottles at your next charity event, company outing, or as part of your brand’s event promotions. Here are a few memorable ways you can maximize these branded labels. Give away a bottle of water at an outdoor event like a race or company barbeque. Use our BOPP and vinyl stocks if you need labels that could survive being dunked in ice water unscathed. Create real estate water bottle labels. Give a refreshing drink away at your next open house or during a property showing session with potential clients. Include your contact details, company name, and hot listing details so that customers bring home more information on your business. Personalized for special occasions. Create a design that highlights your company’s anniversary or a milestone worth celebrating.